When pubs close in built-up residential areas (and the fact of pub closures is surely not under dispute, though one might quibble about the extent to which it is or has been happening), they are most frequently small local pubs. These are pubs, often in the back streets of an area, which catered to a predominantly working-class population who may not have travelled far for their work, and for whom the pub was a centre of social cohesion. Successful pubs in London now increasingly follow trends and chase the capricious middle-classes, and it seems the reason for that is primarily economic. Local pubs, which did not need to adapt to attract such drinkers, could rely on local trade, but with regularly increasing taxation on the price of drinks in licensed premises and the lure of cheaper bulk alcohol prices in supermarkets, the attractions of the pub have fallen amongst this traditional core of drinkers. The closure of neighbourhood locals hasn’t even been entirely related to economic downturn or recovery, but to changing social attitudes among those passing laws (and their constituencies). Such changes in attitudes have been not only with respect to alcohol consumption, but also to smoking. Indeed, the 2007 ban on smoking indoors has frequently been cited as a key reason for pub closures.4 History shows that many of the biggest upheavals to the trade have come from changes in laws: the proliferation of gin houses (and the so-called “gin palaces”) in the 18th century and their subsequent disappearance is just one such story.5 The disappearance of neighbourhood locals now is another. This is also partially related to the practices of modern PubCos, themselves affected by changes to laws governing the trade. Massive pub owners like Enterprise Inns and Admiral Taverns look for the maximum return from their investments, which happen to be in pubs. Those which fail as businesses (or just fail to make as much money as the property is worth, see below) are sold, and those which are successful attract heavier mark-ups from the PubCo, sometimes forcing even their closure. Another factor in the disappearance of pubs in central London has been the huge changes to property prices over the last few decades. This is both because the value of a pub as property can in many areas outstrip that pub’s ability to make money from their trade, and because the core drinkers supporting these pubs are forced from a gentrifying area (where affordable housing stock has been depleted) to more remote suburbs. This is particularly noticeable in the most affluent parts of town: there are plenty of former pubs in Chelsea and Kensington, for example, often looking quite different now as they’ve been comprehensively overhauled (closed pubs in poorer areas have usually suffered fewer cosmetic changes, and are still relatively recognisable). The simplest form is a pub which has been boarded up, otherwise retaining all its signage (such as The Victoria [Charlton SE7], fig. 84). These can survive in this form for years, depending on the value of the area and the long-term development plans a Council may have. If there’s no money for redevelopment, plans may be delayed and pubs may remain boarded for a long time. Even sites in central London can languish for years, for example the former Intrepid Fox (Soho W1). Figure 85. The Talfourd Arms (Peckham SE15), now closed. Pubs which have been converted to residential or other uses may still, however, retain some sign of their former use. This may be in the form of architectural lettering (etched into the surface of the building itself), hanging signs or etched windows. A relatively obscure back street local pub like The Talfourd Arms (Peckham SE15, fig. 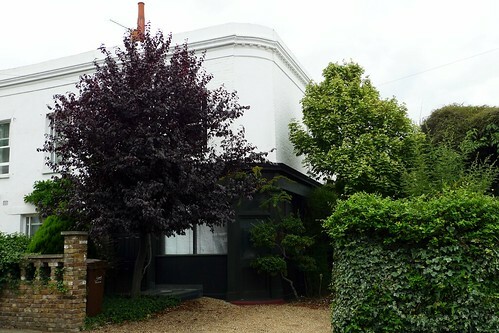 85) may seem fully converted to a residential dwelling and almost impossible to discern as a former pub, but a very careful glance at the windows, almost entirely obscured by foliage, reveals that one still says “Public Bar”. Sometimes even these tell-tale signs of a former pub may have been removed. In such cases, you may need to look for striking architectural features. Pubs will often have spaces where lettering or advertising would have been placed: a strip above the ground floor; a rounded corner; or an enlarged pediment near the roof where a fascia board with the name (or, more often, beer advertising) might have been placed. In the post about former pubs of Soho I mentioned above, you can see The Excelsior (Soho WC2, fig. 37), now demolished for the construction of the Tottenham Court Road Crossrail station. It has a certain pub-like structure, with a board where the contemporary shop name is shown, while the original pub name may have once been engraved at the pediment in the blank space under the “1889” year of construction. Figure 86. The Camden (Camden Town NW1), now closed. Finally, there are those former pub buildings which have been reconfigured almost beyond any recognition. In these cases, the entire ground floor level may have been rebuilt with solid brick,6 the pediments removed,7 and any other identifying features minimised. You may only spot such pubs through diligent research, or from having seen it when it was open. It can be particularly difficult, for example, to discern a former estate pub, as these had always been integrated into the fabric of the surrounding estate, and relatively minor changes may serve to make them unrecognisable as pubs. The very first photo I used on this blog, in my post about estate pubs, was a photo of The Camden (Camden Town NW1, fig. 1). Without having been demolished, this is now entirely unrecognisable as ever having been a pub (fig. 86). There are some wonderfully evocative photos, for example, of The Black Bull and The Old Bell, both in Holborn, in Panoramas of Lost London: Work, Wealth, Poverty and Change 1870-1945 by Philip Davies (Croxley Green: Transatlantic Press, 2011). Both were demolished around the turn of the 20th century. The only remaining galleried coaching inn is famously The George (Borough SE1), about which Pete Brown has written a book. As a small aside, when my London Pubology website is up and running (I am hoping an early version will be in the next few months), you will be able to see all the former pubs of areas such as these plotted on a map, densely packed with the red markers of demolished pubs and the amber of closed ones (alongside a smattering of green flags showing open pubs). This site will essentially just present my database of all London pubs, and the research for it has rather occupied me recently (and probably will take many more years to bring to any state resembling ‘completion’). This information is entirely anecdotal and unresearched (I believe the term is “anecdata”). However, it is certainly true that the population engaged in manufacturing is lower in London than any other region in the UK, and is at a historic low in relation to the past. Many write-ups of the ban (such as that on Wikipedia) are almost solely focused on its effect on pubs. A story told very well in Patrick Dillon’s book Gin: The Much-Lamented Death of Madam Geneva: The Eighteenth-Century Gin Craze (Boston: Justin, Charles & Co., 2003). One such might be The King’s Arms (Bethnal Green E2). Without knowing the address, I could easily have walked right past it. On the former Three Compasses (Soho W1), an ornate pediment can be seen in an archival photo (reproduced at the British History site), though the existing building, now a restaurant, still has something of the look of a former pub. This entry was posted in Pub History and tagged former pubs. Bookmark the permalink. 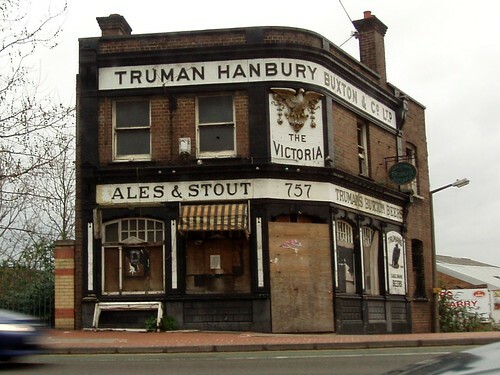 I always find it really sad looking at derelict pubs, or those that have been converted. There’s one on the corner of Mildmay Grove in Islington that, from afar, looks like a fully functioning pub, but up has been converted into flats. That said, it still boasts all the main architectural traits found in any pub and it’s a bit sad thinking about what it once was. I have been reminiscing about the King’s Arms that once stood at the end of the Old Kent Road almost opposite the Bricklayer Arms. I used regularly to frequent this excellent & capacious live music venue during the 1960s. Both the Bricklayers’ & the King’s’ were demolished as part of the massive flyover development. However, whereas I can find a number of references to the Bricklayers’, information regarding the King’s’ is sparse. I was thinking the pub may have actually stood at the beginning of New Kent Road (l have no contemporaneous map with which to check) but I have a least found a 1944 reference to the King’s Arms, 39 Old Kent Road which would seem to match my recollection spot on, the Bricklayers having been at 40 Old Kent Road. Could you provide some more information especially a photograph or point me in the right direction, please? I can tell you that we have entries for the King’s Arms listed at 40 Old Kent Road from 1871 to 1899. The Bricklayer’s Arms is listed at 37 (in 1899 at 37 & 39) and we have it listed from 1882. 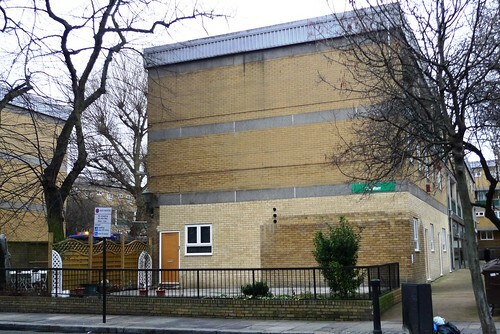 Unfortunately, no photographs … Have you tried Southwark Library? I am currently researching 19th century pubs that were managed by pugilists. Your site has been invaluable with a wealth of in depth information. Obviously the records only go so far back, which requires further investigation for any other snippets of information. The one that has puzzled me the most is the Bricklayers Arms that was run for a time by Tom Sayers, probably the most recognized name in the field of pugilism. I have found many references linking Tom to this pub, which I believe was in the 1850’s, perhaps 1860’s. They all state Camden town as the location and one mentions York Road. I have whittled the choices down to about three pubs and would appreciate any other information on this subject. Once again, I thank you for your commitment to provide information that will maintain an important part of our history. I can’t find any records of a Thomas Sayers running a pub in the 1850s Post Office directories I’ve looked at (the 1851 and 1856 ones), nor indeed any pubs called the Bricklayers Arms on a York Road. The best guess for the road you mean based on your description would be the one that runs from Kings Cross to Camden Road (now called York Way). I have records of a number of beer sellers on this road for which I can’t find the names of their establishments, so it’s possible there may have been a Bricklayers Arms along this road, but I haven’t yet found it (and certainly no evidence of a Sayers at any of them). I did find his entry in the 1861 census, which has him living at 10 Belle Vue Cottages, Camden Street (in Camden Town) and lists his occupation as “Pugilist, Champion of England” in big bold letters, so the pub obviously wasn’t there, but of course he may still have been involved in some capacity with a pub somewhere. Perhaps he owned one, rather than himself managing it? Which are the three pubs you are thinking of? Thank you for your prompt reply and effort in trying to help me. I apologies for not replying sooner, as I’m not use to blogs and was unsure where your response would be. Below are some of the references I have found. ‘He set up the “Bricklayers’ Arms,” in Camden Town, but, scarcely established, got restless again, and started on a provincial tour’. Book – Fights For The Championship, The Men And Their Times. By Fred Henning. ‘He had left the Bricklayers Arms in Camden Town, where he had but a short tenancy, for Tom had no head for business’. I have several more references all stating Camden Town, but none that are more specific. I cannot find any other Bricklayers arms in the Camden area, nor can I find any link with Tom Sayers and the above pubs. I didn’t realize about your interest in films and must add here, one of my favourites. It is called ‘The Ninth Configuration’. Have you seen it, if so, what are your thoughts? Yes I suppose this correspondence is probably better carried out via e-mail. In any case, I don’t think either of those pubs are likely, as neither is in Camden Town (though they are both in the modern London Borough of Camden, but that’s a different thing). However, given your first reference below mentions it’s on York Street rather than York Road, it’s worth mentioning that there is in fact a York Street in Camden Town (or there was in the mid-19th century). It’s the street now called Greenland Street, running between the High Street and Bayham Street. The Post Office directories don’t mention any pub or beer retailer on the street, but in the 1851, 1861 and 1871 census records there is a beer seller at 12 York Street (or 13 York Street in the 1871 census). This is named as the “Coach Makers Arms beer shop” in 1851, so perhaps Tom Sayers took it over in the late-1850s and renamed it? Alternatively there may have been another, very short-lived pub on the street, but I can’t find any record of it. I’ve added it to my site here (http://pubology.co.uk/pubs/12806.html). Oh and I haven’t seen The Ninth Configuration; I’m afraid I’m not hugely knowledgeable about horror films. I just wanted to say thank you both for this interesting discussion which I have enjoyed reading immensely. I work for Highgate Cemetery, where Tom Sayers is buried, and I know our tour guides would love to know where the Bricklayer’s Arms was. I will let you know if I manage to find out anything further to your discussion.